This response was designed to knock-out the exclusivist view of salvation. The argument’s purpose was to say, “If you take the path of exclusivism, things get too complicated; so here’s an easier path.” What was the easier path? Inclusivism! I had read the argument from several inclusivists before, and had read the same argument from some inclusivists since then; but I did not know at the time how to answer the question. For me, it was beside the point: the question is, “Can one place faith in someone else except Jesus and be saved by Jesus?” For me, the answer was “no,” so I didn’t need to bother with the question. I just believed that the question was another inclusivist ploy designed to knock down the exclusivist argument. No worries. But while reading F. Leroy Forlines’s Reformed Arminian systematic theology this week, I discovered the answer to the question that the blog post provided. It might have taken me some time to get my mind around the question, but the Lord has graced me to do it...and now, I’m back to answer the question, “Where’s the Cutoff Date?”. “Another thing that we must keep in mind is that some of the Jews who heard Jesus had been saved as Old Testament saints, and were saved prior to the time that they met Jesus. These people would have believed in Jesus when they were confronted with His miracles and His teachings. 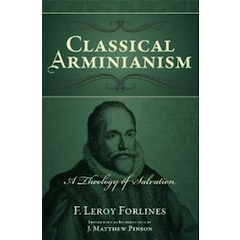 They became His followers” (F. Leroy Forlines, Classical Arminianism: A Theology of Salvation. Nashville: Randall House, 2011, page 153). “...many who were living when Jesus came were already saved. Their heart was right with God. They were submissive to God. When they met Jesus, saw His miracles, and heard His teachings, they believed in Him. It was this kind of people that Jesus had in mind when He said in John 7:17, ‘If any man is willing to do His [the Father’s] will, he shall know of the teaching, whether it is of God or whether I speak of myself’ (NASB)” (Forlines, Classical Arminianism, page 162). Forlines has a point here that is worth noting. Scripture itself indicates such “Yahweh” believers who awaited the time of the Messiah. One such example is Simeon. According to Luke’s Gospel, Simeon was one who was “waiting for the Consolation of Israel,” Jesus Christ (Luke 2:25, NKJV). John’s Gospel provides another powerful example. The Samaritan woman was waiting for Jesus, too. In her conversation with Jesus, the Samaritan woman confided, “I know that Messiah is coming. When He comes, He will tell us all things” (John 4:25). Last but never least, we cannot forget John the Baptist, who was the forerunner of Christ. John told the people he preached to in the wilderness that One was coming after him, who was indeed the Christ, and would baptize them with the Holy Ghost and with fire (Luke 3:15). Back to the temple scene, days after Jesus’ circumcision, Anna the prophetess “spoke of Him to all those who looked for redemption in Jerusalem” (Luke 2:38). It appears that many were believers in “Yahweh” who were anxiously awaiting the arrival of the Messiah to earth. These individuals would serve as examples of those who were members of the “threshold” generation---that is, those who believed in Yahweh, but would now need to place their faith in the fullest revelation of Yahweh God, that being Jesus Christ. Jesus spoke of the threshold generation that the Father gave to Him: “It is written in the prophets, ‘And they shall all be taught by God.’ Therefore everyone who has heard and learned from the Father comes to Me” (John 6:45). In this verse alone, Jesus cites Isaiah 54:13 to show the Jews that their Hebrew Scriptures foretold of His coming. Since Jesus Himself was God’s fullest revelation, they could not learn from the Father without coming to Him. In other words, by using Isaiah 54, Jesus was claiming to be divine deity. If they learned from Yahweh, they would come to Jesus. Why? Because their Scriptures testified to Jesus as being divine and proceeding from God. John would later write in 1 John 5 that “he who does not believe God has made Him out to be a liar, because he has not believed the testimony that God has given of His Son” (1 John 5:10). There was nothing complicated about the matter to the threshold generation: they always knew that Messiah was coming. God’s revelation (even in their Old Testament Scriptures) was unambiguously clear concerning the arrival and birth of Jesus Christ. So, again, “Where’s the cutoff date?” The cutoff date consisted with those who were alive at the time of Christ’s coming. That generation that believed in Yahweh, knew their Scriptures and knew that the Messiah was soon to come, mark the dividing line between those who only believed in “Yahweh” versus those who would now have to transfer faith from Yahweh to Jesus. Scripture itself does not complicate the matter. Scripture is not too complex for comprehension. As my final note, though, let me say that regarding those who died believing in Yahweh and those who transferred faith to Jesus...God was not unfair in allowing one to die with less revelation than another. The emphasis is not on the amount of revelation, but what is done with the revelation given. At the same time, let me be clear about our contemporary world: God once overlooked the lack of revelation; now that Christ is come, God commands all men everywhere to repent (Acts 17:30-31). One day, Christ will return to judge the world, and it is this just judge every man, woman, boy, and girl will have to stand before to give an account of the deeds they have done in the body, whether good or bad (2 Cor. 5:10). I sympathize with the inclusivist argument; I too, desire that people not be damned to hell for not believing in God when they could not; however, at the same time, I do not believe these individuals will be able to say, “I didn’t know.” The Lord is the Lord of all creation, and He can manifest Himself to those who do not have the necessary resources. Did Christ not die for them? Does Christ not love them? We can emphasize Christ’s love for those who may be spiritually handicapped (without a human messenger and Bible) without denying the necessity of the gospel and faith for salvation. I would rather leave it to God to take the gospel where humans cannot travel, than to deny and erase the gospel in order to widen the umbrella of the saved. Which is stronger: the free will of man, or the sovereignty of God?? Great post my sister. As I have said before, you are an excellent writer. I thank God that you use your gifts for Him. Thanks so much. I am thankful to God that He finally gave me an answer for the confusion. I want inclusivists to know that I read their work and consider their views and theology; at the same time, I have yet to be convinced that the inclusivist view is true. And I think this threshold generation the Bible sheds light on is even more problematic for the inclusivist camp. I love them as my brothers and sisters in Christ...and for fellow Arminian brethren, I don't mind us standing together against Calvinism. But when it comes to exclusivism/inclusivism, I'll rub elbows with even Calvinists...because I hold to the belief that if Jesus is really the only way to salvation, why attempt to be saved some other way? God bless.